Silver Oak Casino is one of the industry’s oldest casinos, trusted by players all over the world to deliver great games, fast payouts, and easy deposits. Find out if Silver Oak Casino impresses players today the way they used to by reading our review. New players at Silver Oak can enjoy a $10,000 Welcome Bonus package and a special $50 No Deposit Bonus. Silver Oak Casino offers a comprehensive selection of online slots and table games. You’ll find over 100 online slots games alone, including the classics Naughty or Nice Spring Break, Loch Ness Loot, Santa Strikes Back, and Lucha Libre. Silver Oak Casino works with its online slots partner Realtime Gaming to deliver new slots games on a frequent though irregular basis. No matter what type of slots game you’re looking for, whether 3-reel classic, 5-reel video slots, progressive, or slots with bonus rounds, Silver Oak Casino offers them. 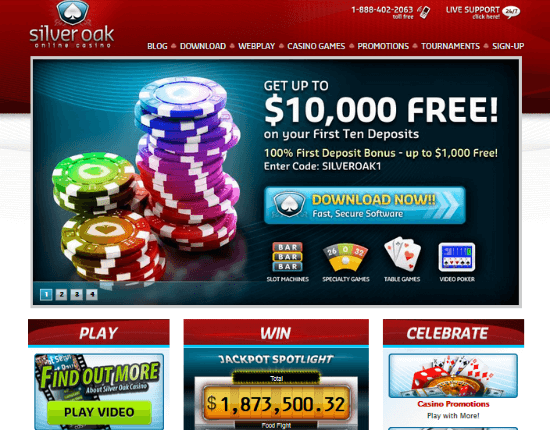 These days, you can try Silver Oak casino for free with a special no deposit bonus of $50. All you need to do is click on the link, sign up and claim bonus code SILVER50 . Your account with be immediately credited with a $50 Free chip. Silver Oak offers new players up to $10,000 in welcome bonus cash in the form of 10 separate deposit bonuses, each worth 100% and up to $1,000. So if you deposit $500, you’ll get $500 in bonus money. You need to use a separate bonus code for each deposit, so consult the website for all the info. Each month, Silver Oak offers a new bonus with a match dollars and a free chip. The value of the match bonus changes each month, but you’ll be told what it is at the start of the month. When you make a deposit and use the Crewpon bonus code, you’ll immediately earn the match bonus. You’ll also earn a free chip, but you won’t get it until the start of the next month. That’s because the value of the free chip varies based on how many players take advantage of the Crewpon bonus. The more people who claim the bonus, the higher the value of the free chip can climb, all the way up to $1,000. For Mac and PC users, Silver Oak offers several options. Windows users can download the free online casino software or access the games through Instant Play, a version that lets you play games through your web browser. While there’s no downloadable software available for Apple fans, you can use the Instant Play version to enjoy Silver Oak Casino on your Mac. 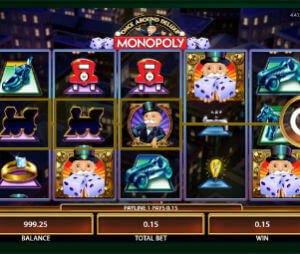 Silver Oak mobile casino offers a variety of games on its mobile app. One of the biggest complaints we have when reviewing other online casinos is that their mobile experience doesn’t match their desktop. Silver Oak Casino delivers a solid mobile experience and features many of its popular titles, including the recently released Lucha Libre. The mobile app works on iPhone, Android, BlackBerry, and several Windows Phone devices we’ve tested. If you’re worried about having to jump through hoops to download software, you’ll be happy to know that Silver Oak Casino’s mobile app works without the need to download. Just navigate to the Silver Oak Casino website on your mobile device and the app will load automatically. There’s no risk to try Silver Oak casino. Using our links, you can play for free and test out all the games, so try it now.